Our great Aunt Prudence Stokes inspired this sweet, peanutty treat. Aunt Prudence, fondly called "Candy" by friends and family, would have been proud to send these fresh and delicious homemade goodies to her best friends. Combining our Blister-Fried Peanuts with the goodness of smooth butterscotch for a sweet down-home taste, makes these butterscotch candies irresistible. Ordered these for a Christmas gift and decided to order and extra one for me to try. These are great! What a fantastic treat. The butterscotch and peanut flavor combined is great! So glad I tried them. These little gems are so so good. They just keep getting better the more you eat. I am so mad for not ordering before they went out of season. But I'll get them next season. I buy cases of these every year in the largest size available and give as Christmas gifts to all our friends - everyone loves them! Oct 23, 2012 | By Amy T.
The butterscotch flavor is just enough without overwhelming the peanut. Love them! A HUGE hit with my family and friends!! When my friends know I'm going to Bertie's peanuts I get a request list a mile long. I'm giving them for Christmas presents for the 3rd year in a row. This will be an annual gift. Given as a stocking stuffer to my husband who loves butterscotch--they were a big hit! Delicious! My father is notoriously difficult to buy for; however, I hit a homerun with these butterscotch peanuts! This was a unique and delicious surprise in his stocking. Shipping was fast and delivered as promised. I'm glad to support this family-run business. We'll order again! Thanks so much. Tried for first time and everyone loved. Fresh, sweet, salty all in one. I didn't know if this combo would work, but I like them. Delicious butterscotch flavor on perfect peanuts. So good! I wish I would have found these before it got to warm to ship them, they are so good!!! I'd love to know if any local store to me carries them. Butterscotch Peanuts are the BOMB! When you think you're just going to take a few butterscotch peanuts it just doesn't happen. Once I start eating I have a hard time stopping. They are terrific!! The sweetness of the buterscotch and the crispy peanuts is a combination that is hard to beat. 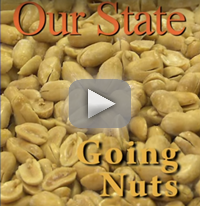 How can Bertie County Peanuts be better? Add Butterscotch! Love your products, only wish it didn't cost so much to ship. Never heard of Butterscotch peanuts before but, their terrific! Delicious and a great gift. We ordered the Butterscotch Peanuts and the Sea Salt and Cracked Pepper Peanuts for Christmas gifts this year....hands down, the best peanuts we have ever tasted and everybody loves them! So fresh and flavorful and so many flavors to choose from. Love my Bertie County Peanuts!!! Love the butterscotch - give them as gifts as well and they are a big hit! These are the best peanuts ever! Bought them for my husband and son-in-law. They can't stop eating them, they asked me to move them out of their reach! The Peanuts are perfect and the flavor combination is wonderful!!! Everything I've had that you make is wonderful. But the butterscotch peanuts are too good for words. On my next to last order I got the big container which was a big mistake. I don't know when to stop eating once I start. This last order I got 6 small containers of the butterscotch peanuts. I still embarrass myself once I get started but the smaller containers give me a little less guilt since I have a hard time stopping on my own. Keep up the good work. Great butterscotch taste and the blister fried underneath is awesome. This was not my first order. We were hesitant to get them but we love butterscotch so we tried it...what a treat! They were delicious! Cannot believe it, but I like these better than the chocolate covered. Keep'em coming ! Great idea. The butterscotch are the best !!! Sweet & a little salty!! GREAT! Very good flavor just the right amount of butterscotch so you can still taste the peanuts to. Chocolate covered peanuts are my absolute favorite! The mystery of the disappearing nuts! The only complaint my husband and I have is that all of the nuts are disappearing entirely too quickly! 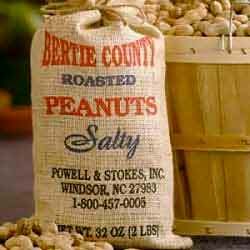 We have order about five times from Bertie County Peanuts Company and have never been disappointed. My only suggestion is to buy the smaller containers because the larger ones are too much for one or two people to eat before they go stale. We visited No. Carolina last fall, got the chance to talk to the owner. What a wonderful chat we had, I have been boiling peanuts ever since. These Butterscotch covered peanuts are too good, it's a good thing I must get them mail order, I could eat them everyday! Instead I buy them at Christmas time as a sweet treat! I love the Butterscotch the most and I also like the Honey Roasted. 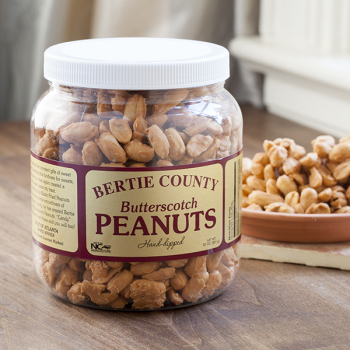 I have bought all all different kinds of peanuts but Bertie is the only place you can get the butterscotch peanuts. I buy 5-30oz jars every 6 weeks and they are very tasty. AWESOME!!! Tasted so fresh and the best part was the prompt email response I received when asking a question via the "contact us" part of the online website. Delivery was when promised, candy-covered peanuts DELICIOUS!!! Thank you. Delicious! If you love butterscotch, these peanuts are for you. I ordered the 12 jars of butterscotch peanuts to give as gifts to my neighbors & family. I love these peanuts. Of course, I had to take one jar for me and I have a handful of these peanuts each evening. Our company, St John Cobb has gotten some of the spicer peanuts as gifts for clients and they have been very popular. I would recommend any of these peanuts. Great product! Love these for gifts! Delicious, and I know my co-workers will love! Highly recommend. I am a purist a heart...the blister fried peanuts are so good, why mess with them. I thought - maybe chocolate, butterscotch? No way. Boy, was I ever wrong. that was a match made in Bachelor Bay heaven. If you don't like these you just ain't right. 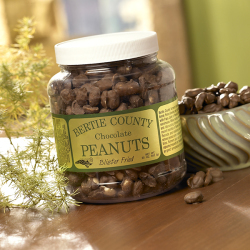 Bertie county has the best peanuts out there. I have bought from y'all before & just love the nuts! 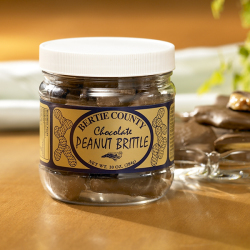 A variety of Bertie County peanuts were provided as table snacks for a long, three day meeting. The butterscotch peanuts were a great hit with some of the ladies in our group who were intimidated by the spicy nuts. They commented that the salty/sweet combination was just right. Butterscotch was a favorite with about 10-20% of the Group. They have the best peanuts I have ever bought!! I have purchased several types of nuts and they all have been excellent!! I love the Butterscotch Peanuts and have been ordering them from you since i stopped in your store traveling back from Ohio about 6 years ago. The Butterscotch Peanuts are delicious!! Wish I could eat them every day. A must order for any holiday or everyday ! The butterscotch peanuts are amazing. It is very hard to just eat a few. Love the butterscotch peanuts. They are a great sweet treat. Usually purchase while up in North Carolina but felt the need to order. Love them. These are the most scrumptious peanuts ever! Great for nibbles and dessert toppings!